Additional information about the Steen Skybolt Graphic: This Steen Skybolt, is a two seater sports biplane manufactured in 1982, the Steen Skybolt is powered by a Lycoming IO-360-C1B 200hp fuel injected piston engine. 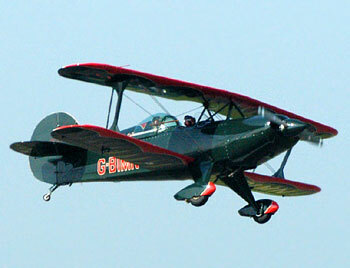 Siteseen Ltd. are the sole copyright holders of this Steen Skybolt G-BIMN picture, unless otherwise stated. We only authorise non-commercial picture use and particularly encourage their use for educational purposes. This Steen Skybolt G-BIMN picture is not in the Public Domain. 1) www.educationalresource.info must be credited as the copyright holders wherever this Steen Skybolt picture is used. 3) Use of this Steen Skybolt G-BIMN picture, or any of our pictures on websites re-distributing copyright free material is strictly prohibited.